President Donald Trump insists his new trade agreement with Mexico and Canada will address the exporting of U.S. manufacturing jobs overseas. That pledge, however, comes on the heels of auto giant General Motors' announcement of the layoff of 14,000 employees in five factories in the United States and Canada, VOA news reports. Despite the president’s optimistic pronouncements, the General Motors announcement indicates broader market shifts in the automotive industry that are unlikely to be reversed. 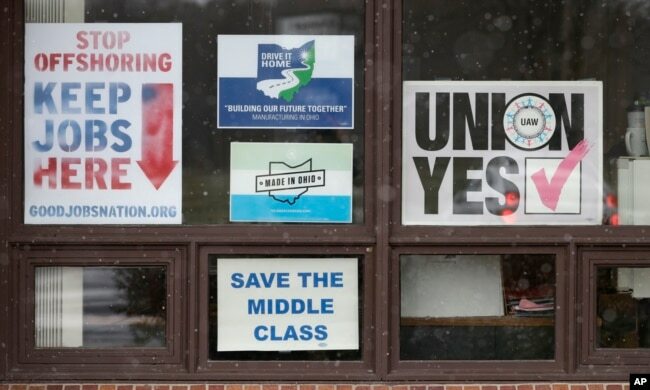 FILE — Signs hang from windows at the UAW Local 1112 union hall in Lordstown, Ohio, Nov. 27, 2018. Workers are holding on to that hope with the Lordstown plant in an «unallocated status» that leaves open the possibility of GM moving in another product. Local union leader Dave Green acknowledged that issues with the Chevy Cruze were part of an overall industry trend away from smaller cars. 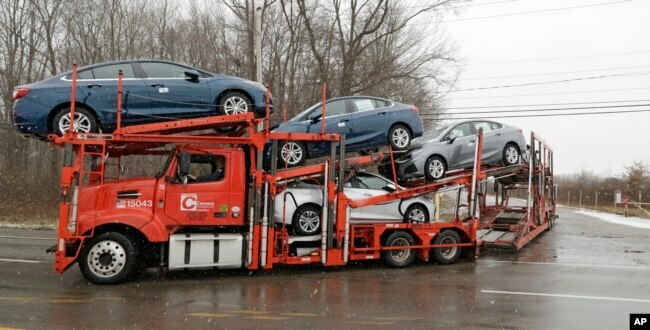 FILE — An auto transport truck full of new cars drives out of the General Motors Lordstown plant, Nov. 27, 2018. Green said 80 percent of the plant’s production is sold within a 600-mile radius. «GM would be foolish to walk away from it,» he said. The 1,600 workers anticipating a March 2019 layoff from the Lordstown plant certainly hope that’s the case. They earn $ 30−40 an hour compared to the next best option in the area, $ 10 an hour at the aluminum factory. «That's is the largest plant that we have,» said Trish Williams, owner of the Ice House restaurant in Austintown, Ohio. She has several family members and friends who have worked at the GM plant in the past and present. «That keeps this town going. Our steel mills are gone. Our factories are gone. [Hewlitt] Packard is closed. General Electric is gone. Chrysler is gone and GM was it. GM was what kept this here — it may turn into a ghost town,» Williams said. 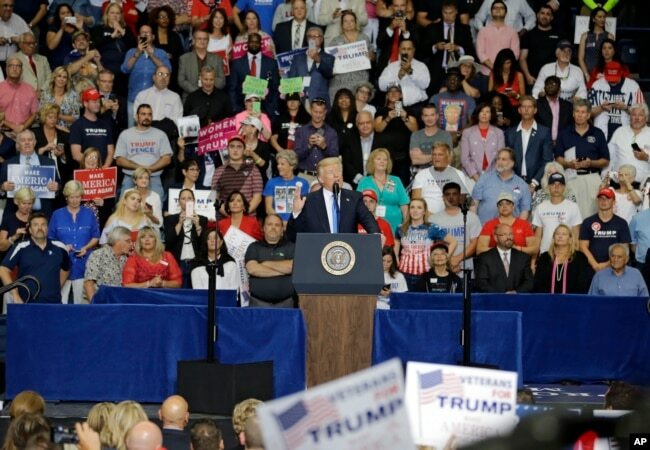 FILE — President Donald Trump speaks during a rally at the Covelli Centre in Youngstown, Ohio, July 25, 2017. Many residents said they do not hold Trump responsible for GM’s decision, a move that could devastate the local economy. Some of those workers will be able to transfer to other plants around the country based on their seniority within GM. But many workers expressed concern to VOA about the number of temporary employees — who earn far lower rates per hour — working in those plants. They are also aware of GM’s plant in Mexico that builds the Chevy Blazer, an SUV. «We're the ones that build this car, we are the ones that got this company this far and who are the ones who are suffering? The worker, not corporate America. Six billion dollars in the third-quarter and they can justify laying off 14,000 people,» she said. Those 14,000 people represent just 7 percent of GM’s 180,000-person workforce, a strategic shift for a company in a competitive automotive market. What remains to be seen is whether that strategic shift will include places like Lordstown. «Business-wise that makes sense, but then to sell it here in the United States doesn’t make much sense for American people to buy an American car that’s built in another country,» he told VOA.